Sometimes I feel like the process of designing and decorating my house is a journey of self-discovery. I’ll see ideas online that look amazing, so I’ll try it out for myself, and then realize that I don’t really actually like it. Or more often, I’ll realize that it looks good in pictures in another person’s home, but for some reason (which I may or may not be able to put my finger on) it just doesn’t work well for me in my home. But I wouldn’t have known it without actually trying it, because again, the pictures that inspired me look pretty awesome. It has happened several times (painted striped kitchen floors, anyone? ), and I find that it has happened again. Thankfully, this time I haven’t gotten so far in the project that there will be any work that needs to be undone/redone. Obviously, as you know from the title of this post, I’m talking about the white walls in the front room (entryway and dining room). While my walls haven’t actually been painted yet (so no undoing/redoing necessary), they are primed white. I’ve been living with white (primed) walls in that room for about a week now, and I’ve just come to discover that white walls (full white from baseboard to ceiling) just aren’t for me. I love how clean and crisp it looks, and I love how my bold coral buffet looks against a crisp white wall. But there are two reasons why I don’t like white walls: (1) It feels so cold and sterile. I can’t imagine wanting to spend much time in there come winter. (2) I don’t like that all of the trim (baseboards, crown moulding, door casings, and window casings) gets completely lost when they’re all painted the same color as the walls. It’s just a sea of sterile, cold white where details get lost. 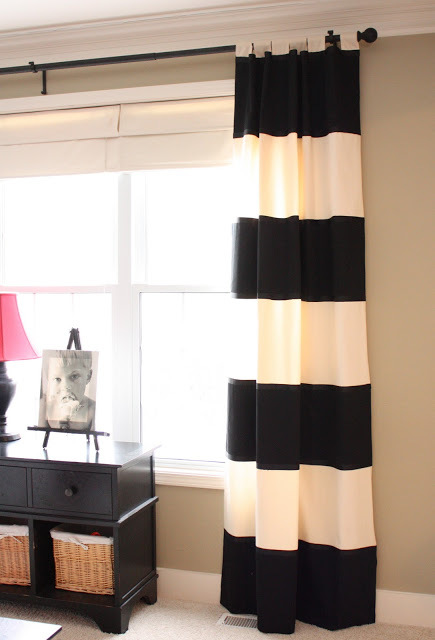 Another reason why I don’t want white walls in that particular room is because I want black and white striped curtains, and just this weekend, as I was perusing pictures of black and white curtains on Pinterest, I noticed that all of the examples that really stood out to me as the most beautiful had the curtains set against light neutral, non-white walls (at least on the upper part of the walls). 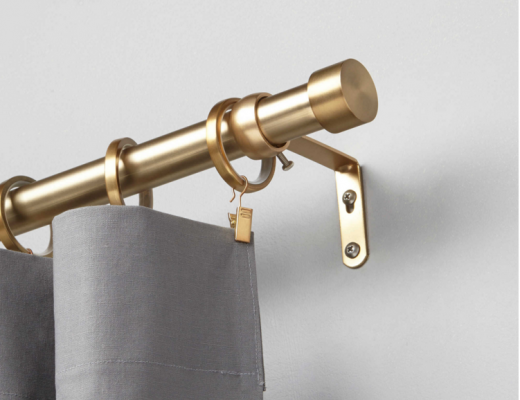 These curtains from The Yellow Cape Cod are always my go-to for the look I want (minus the tab tops). And hers look perfect set against the non-white neutral walls. So this past week, I’ve been really paying attention to (and actively searching for) any rooms with full-wall picture frame moulding walls that aren’t painted white. I keep coming back to this room by Sarah Richardson. These walls, with the chair rail and everything underneath painted white, and the area above the chair rail painted a different color, are absolute perfection in my book. I think the color she used on the upper part of the walls in that room, while absolutely gorgeous and perfect for that bedroom, is probably too dark for my room. I don’t need a lot of depth of color. I just want something that will allow the crown moulding, door casings, and window casings to actually be noticed rather than blending in. Choosing neutral wall colors is always a challenge for me. Something will look perfect on the paint card, but on the wall it turns too red, or too green, or too muddy, or too something. And since I’ll still be using a lot of bright colors, I need something that will still have that light, clean, crisp look. And that means staying away from anything that turns too brown, and keeping to colors that are more gray. I’ve narrowed it down to two colors. I painted a sample on a scrap piece of drywall last night, so I’ve only seen them late at night so far. I’m anxious to see how they both look at various times of the day today. Anyway, the two colors I’ve narrowed it down to are Agreeable Gray and Anew Gray, both by Sherwin Williams. I think Agreeable Gray is my favorite. It’s quite a bit lighter than Anew Gray, but still gives enough color to be interesting. 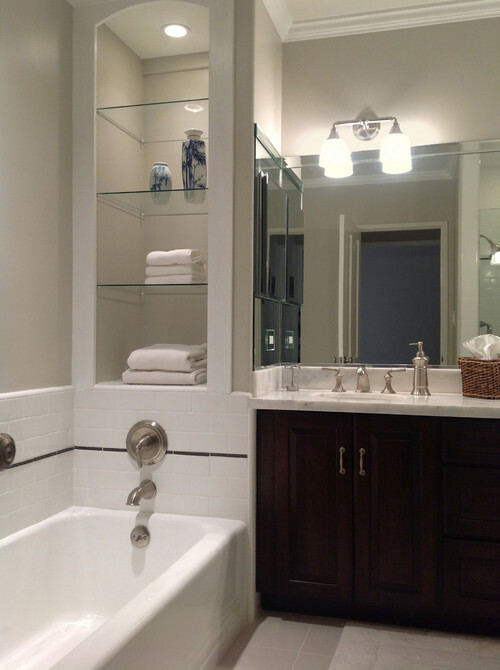 I love how it looks in this bathroom against the white tile and white crown moulding. It was used on these bedroom walls, along with Anew Gray on the tray ceiling. And here’s another look at it used above white wainscoting. I think it’s such a pretty color. It gives just enough difference to really make the trim stand out, and it doesn’t feel cold and sterile like my all-white walls do. When you see Agreeable Gray and Anew Gray side-by-side (like on my sample board), Anew Gray looks quite a bit darker. And yet, in most pictures where it has been used on the walls, it still looks quite light and airy. I think it would look beautiful against white trim, but it looks like they also painted the trim Anew Gray in this bedroom. And then here it is used on kitchen cabinets. Have any of you used either of these colors? I’m leaning towards Agreeable Gray, but I think that might be because it feels like the safer choice. That’s probably not a good reason to choose it. Anew Gray would give me a look closer to the walls in the Sarah Richardson room that I really love. Oh, and I also decided to use the lightest color on this same color card as the background for my birds and limbs “wallpaper” in the music room. I think a white background will look too stark in that room as well. (And there’s probably a good reason why the manufacturers of that wallpaper didn’t set the design against a stark white background.) The lightest color on that paint strip is called Incredible White, and I think it’ll look beautiful as the background for my design. It’ll also give the slightest bit of contrast with the wainscoting and trim in that room. I found this close-up view of Incredible White used with Extra White on the trim from Elements Of Style. I came across a lot of pictures where people had actually used Incredible White as the trim color, and on its own, it does look white. But up against a brigher white, it has the slightest bit of color to it. I think it’ll be the perfect backdrop for my music room design, while still giving some contrast with my white trim and wainscoting. Okay, I know you are looking for a gray. BUT if by chance you want a also consider lighter tan color with a gray undertone I HIGHLY suggested sandstone cliff, a Behr color. I LOVE it. My whole house is painted that color. I did mix it with the shade lighter on the paint card for one bathroom that doesn’t get a ton of natural light. I can’t begin to say how happy this paint color (in my house) has made me. I like that color. I too think that you will not like grays. Ann Marie I love this color! Thanks for linking it, as we are going to be building a new home, and I was thinking of paint colors. We have lived with a few taupe shades, but darker, and I have been stumped at paint colors with all of our chocolate furnishings. I wanted a gray (I thought) but they just weren’t working. I typically don’t like cool tones, so this may do the trick for me! I absolutely love the color we picked for much of our house: Behr Orange Glow 310C-2. It is _not_ orange at all. We live in Seattle, and it just makes our rooms look like there’s sunshine no matter what our weather is. I couldn’t find an example, but here’s the sample page: http://m.behr.com/h5/mobile/en_US/color_details?page_url=http%3A%2F%2Fwww.behr.com%2Fconsumer%2FColorDetailView%2F310C-2. It looks great next to our white molding and chocolate brown furniture. I agree with Ann Marie @ Twice Lovely. That Sandstone Cliff is a warmer easier on the eyes color I think. Light gray, although an elegant color, still has the cold look of plain white. I have Agreeable Gray in our master bedroom and bath. I absolutely love it for the same reason it allows the trim to pop it is quite a soothing color as well. I was afraid when we painted that it would make the bedroom feel cold (as in steely gray) but was plesantly surprised when itr did not. I hope you go with the Agreeable Gray it will be stunning. I’m in the same boat. I keep trying to find a color that will go with my beige ceilings because I was hoping to not paint them. I’d love to here what others have done with their ceilings. I Love Love Love Anew Gray. I used it in my kitchen with white cabinets and it’s Amazing! In my lighting it has a subtle tan undertone to it, and at other times it has a purple undertone! I’m fixing to use it in an upstairs bedroom as well. I LOVE this gray! Check out B. Moore “Alaskan Husky.” It’s a light gray. But it works with everything: warm tones, cool tones…..everywhere. It works in my kitchen with the warm wood cabinets. It works in my living room with my apple green, French Provincial tv stand/entertainment unit. It works in my dining room with white wainscoting and creamy white china cabinet. Gorgeous. No more angst over neutral wall color in this house. My guest bedroom is painted Agreeable Gray and I absolutely love it. Every time I walk in that room I want to paint my whole house that color. 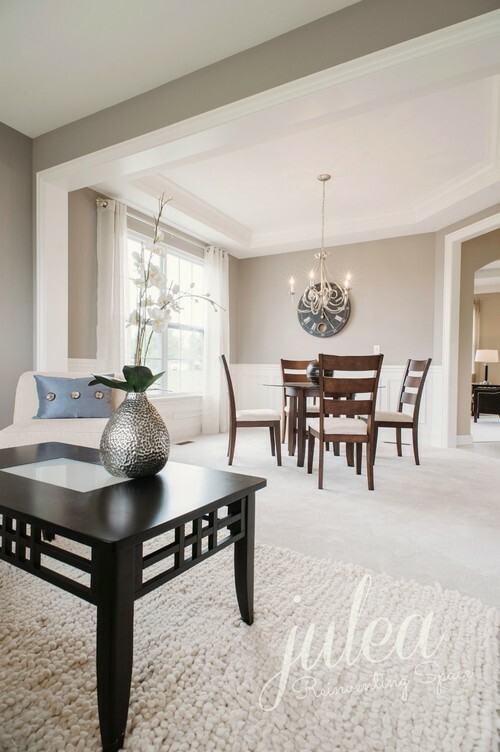 Very soft, warm gray that looks really good with the white trim. Not cold and sterile at all. BTW love, love, love your blog!! You probably already looked at it, since you’re looking at Sherwin Williams, but if you haven’t, you may also want to look at Requisite Gray. I actually have 5 shades of warm gray in my house (3 of which are Behr and are probably way too dark for this room), and Requisite Gray is one of my absolute favorites. It’s definitely not ever going to read blue, although sometimes it will read tan. It’s a fabulous color, and really makes the bright white trim pop. I agree! I used this color in my kitchen, absolute best color ever! Hi Kristi! We just painted our living room in Anew Gray and we love it! We bought samples of both Anew Gray and Agreeable Gray and the Agreeable was just too light for me. I love the contrast against our white trim and fireplace that the Anew Gray gives us! Our room gets tons of natural light throughout the day, so that definitely keeps it from being too dark. I’m not sure how much light you get in that room, but I think having the white beneath the chair rail would keep it bright enough. I know whichever you choose will be pretty! And the lightest shade for the music room is a great idea. Will warm it up a bit, too, and really help tie the spaces together without everything being the same color. Brava! Can’t wait to see it–I’m totally loving your space! Kristi, I had a question about the picture molding, would you suggest using that on walls with texture? It looks beautiful on your flat walls but wondered about light texture on mine and whether it would look right. Agreeable Gray is one of my favorite grays! I think the name says it all! I also love Repose Gray by Sherwin Williams. I totally get not wanting the trim to fade away, especially when your trim is as great as yours! But, are you sure the walls will feel too white once you’re fully decorated? By the time you hang art and curtains, get your chairs upholstered, put down your carpet, etc., will the room really feel so white? Just a thought. 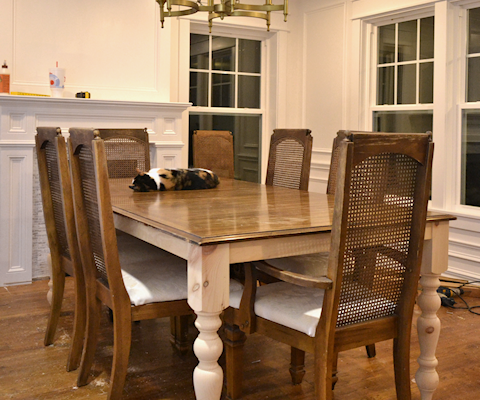 On the flip side, we painted our dining room Seagull Gray from Behr and I LOVED IT!! It’s definitely a warmer gray and it was gorgeous. I picked that by working off the wall color in the nearby living room. In your case, I’d have to start by finding a gray (or other neutral) that worked well with the coral of the buffet and the green of the cabinets (even though they are in a different room, that color is very visible from the dining room and entry). I’m totally a side-by-side person, where I have to see the actual color side-by-side against other colors critical to the space. Whatever you do will be great! I love the Agreeable Gray! I’m not one that likes gray on walls, because of the coldness it puts off. The Agreeable Gray, is so fresh and I think it will fit in with everything you are doing in this area of your house. I also love Incredible White for the music room, I also think you could do one shade darker and it would be nice too! Long time reader, first comment- there’s a big difference between primer and a well-chosen white! Primer IS cold and sterile, but “white” does not have to be. White is a beautiful backdrop for vibrant furniture and accessories, and many of the inspiration images you showed previously demonstrated that effect. I would really consider painting both rooms in Incredible White first- you can always go darker with just one coat, but lighter will usually take more work! I think there will be a beautiful soft contrast with the walls and trim while still providing a background for the adventurous colors and patterns you seem to prefer. When choosing whites testing is so important- large samples hung on each wall of the room, some close to the windows and some not. 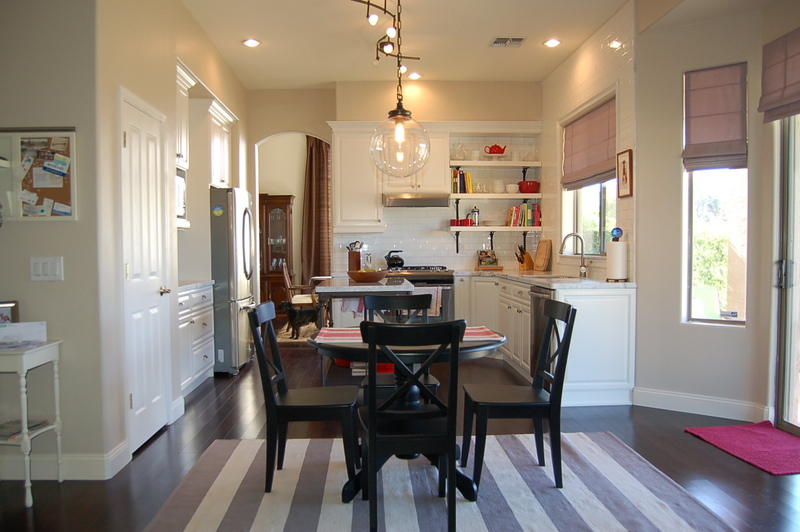 Most whites will look fine with artificial light, so the way it looks in daylight becomes the deciding factor. Sorry for the novel, clearly a topic I’m too passionate about! I can’t tell you how timely this post is for me. 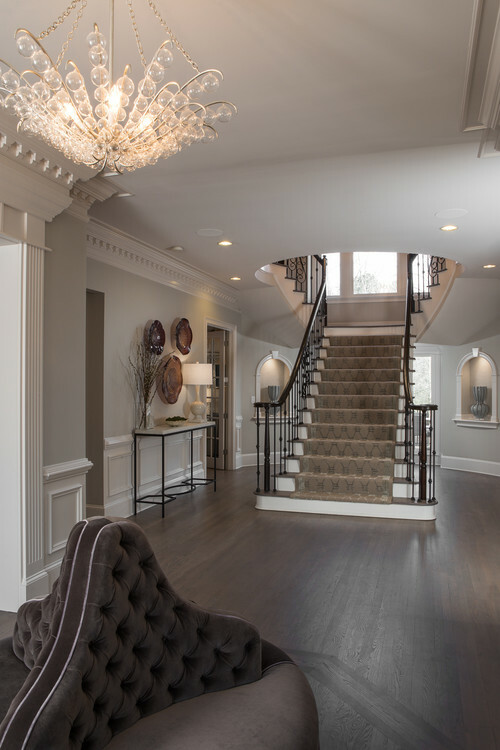 We used Escape Gray in a well lit south facing foyer and open stairs and open upstairs hallway. Love Escape Gray, it looks like a worn old dollar bill to me.http://www.houzz.co.uk/photos/191952/stephen-f-austin-traditional-dining-room-austin No that’s not my foyer, mine is nice but not quite that grand. I now need another gray for the adjoining darker north facing living room and I will take a look at Agreeable Gray and Anew Gray. Can’t wait to see your decision and finished walls! Do you have a sample of your go to white- Behr Polar Bear to put beside the white primer to see how similar or different those colors really are? 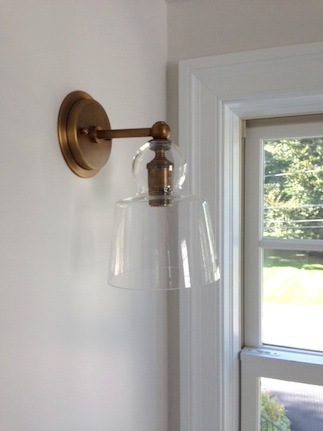 We’ve used SW Dover White on all trim, ceilings, the walls of the bathroom, etc. in the house. I love that it is a creamy, warm white and goes with all my other colors. I wish I could remember the name of my tan/taupe on the walls of my living room and up the stairs. It is the best all around neutral I’ve ever found but I’m getting old and I cannot remember the name, darn it. I love love love anew grey. My downstairs is painted Anew grey and it looks great against my white trim and white cabinets in the kitchen. In my family room I painted anew grey 75 percent. It is lighter but still the same color tone as the 100 percent. Anew grey is more of a tan/grey with warm undertones. No one as walked into my home and said oh you painted it grey. Everyone loves the color and the warm undertones that it has. I suggest trying 50 to 75 percent Anew grey and I don’t think you will be sorry. I found the best light “I can’t tell if it’s grey, tan or off white” color ever. It’s so pale I was unsure but then against my whitest rim it popped! “Whiskers” by Porter paints. 3. All of the pictures you posted (of the paint colors) were colorless. (like all the furniture / bedding was tan or white or grey) Do you have any examples of these colors with COLOR? 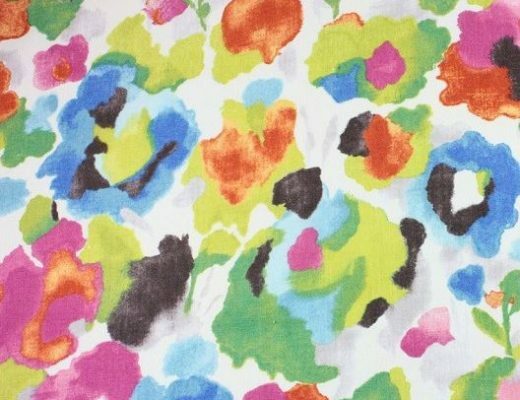 I like the idea of painting the background of the music room “wallpaper” a color. Again, I would make sure it looks good with yellow since your piano will be in front of it. (it seems like the “grey family” would clash) And, I would make sure it looks good with the other two rooms’ paint colors. Whatever you do, I am positive that it will be lovely!! I totally agree! You have such warm happy colors everywhere else. I just cannot envision gray in your house at all!! One color to think about – Coastal Path from Benjamin Moore. And definitely get your curtains and textiles FIRST! So excited to see the end result! One word,,, PEACH, a very light subtle peachy color that is happy and will go with buffet and fabric choices. JMHO. If you choose grey go more tan! I actually tested both those colors two weeks ago. I loved the agreeable gray; but, we ended up getting some leather chairs and a different color family was needed. We switched to the soft beiges and had the rooms painted Casa Blanca/Sherwin Williams. With the white trim, I am loving it. It covered the kitchen wall, which had been a deep vibrant yellow , with no problem. It also covered the test stripes I had in the other rooms and hall with no issues. Great paint. I like Anew Gray but I’ve never used it. Repose Gray from SW is another great light grayish color and you might like it also. We have BM Revere Pewter though out our downstairs and I love it. I started with Revere Pewter for our main room. It’s a great color! We did ultimately end up using Versatile Gray by Sherwin Williams. It has more brown undertones to it. In our room it changes tones so nicely throughout the day, almost a light color during the daytime and a nice cozy darker hue in the evening. Picking the right color and letting it sit for a few days and really take it in over the course of a whole day gives you a good feel for how it will feel in the room. I am not a gray person either, but I have had great success with gray owl by Benjamin Moore. I have it in my kitchen, family room, halls and living room and it looks different in each room– blue in some, warm white in others– everyone always wants to know what colour it is. I really appreciated the comment about the difference in whites because …. you don’t like gray. ☺ Also my (wrong) assumption was that you would paint the upper walls in the dining room something not white! Not an advocate for all white rooms in majority of houses! I think you’re on the right track adding a contrasting neutral to dining room and music room. Still think white foyer is awesome with all the color you will have in there. Timely discussion. Furniture tones and colours must be brought into the equation. I recently brought teak wood into by living\dining areas. The walls are currently painted terracotta which is not doing the teak justice. I am not a grey person either and was surprised when a friend suggested it. I also have white trim so Agreeable grey might be just the right idea. The adjoining kitchen is white so Anew grey or even a tone darker might be good there. Floors are a mid to dark walnut, large wool area carpet is cream\taupe\terracotta\mid and soft blue\brownish red and soft furniture is lighter and darker taupe. I change up the accent pieces with various collections: apple green, pink, rich blue, pottery browns & dark red mixing and combining depending on the season and my whims. A lot of colors that the paint companies call “gray” sure look more like taupe or beige to me. I agree with the commenter who noted that all your example photos have very neutral furnishings and a monochromatic color scheme. Check out http://www.mariakillam.com and Maria’s living room for a nice example of a light neutral wall color with colorful furniture–raspberry drapes, yellow sofa, bright multi-color artwork, graphic black and white rug. I really like this idea of using a grey with brown tones (taupe). I painted my formal living room with 22 foot ceilings SW Perfect Greige and I just love it. It’s darker than you are going for but I really like the lightest color on the card Popular Gray and plan on painting a few rooms that color as well. The taupe colors do not read “cold” grey at all, this will look great in your home. Just wanted to chime in that our entire house – interior and exterior – is SW Agreeable Gray with BM White Dove trim and black doors. Agreeable Gray has been the perfect canvas. It does not have any blue/green/brown undertones, but it is definitely a warm gray. I love that it looks perfectly neutral in any light. It is not dark but still provides contrast to make the trim look crisp white. My house doesn’t have the bones that yours does with all of your molding. I have to admit, if I had all of that fancy molding like you do, I’d paint the whole room BM White Dove in a heartbeat! It’s such a warm rich white! I know this was awhile ago, but could you tell me what color your ceiling is? I am painting most of my house agreeable gray and I was hoping to leave the ceilings but think I maybe need to paint them white. Just curious what others have done. (This whole thing is so stressful for me! 😬) Thanks!! Hi, our ceiling is also BM White Dove like our trim and woodwork but in a flat sheen. For a brighter white, I also like SW Snowbound! Oops hit enter by mistake! I’ve just changed the main lighting in my home from warm white fluoros to daylight LED’s and the difference is amazing. I still have some warming globes in some lamps, still debating on whether to change hen out as well. Mind blown. Surprised you are considering any shade of gray, ha! I am not a white or gray wall person either but I do love taupe. I was in a show home and loved the color and found out it was SW mega greige. Darker than you are looking for, but so pretty because it’s pretty much a taupe. Wishing you a quick decision and solution and can’t wait to see the outcome. Kristi, looking at the pictures of the rooms painted grey with the white woodwork look pretty, crisp and clean, but also cold. You don’t want solid white because it’s too cold, I think you will feel the same way with grey. I think a taupe will bring warmth into your room. Ofcourse, whatever you decide will be gorgeous! Lol, i just read previous comments regarding taupe. Im sorry i repeated!! Agreeable gray-my daughter and niece used that color in their lovely homes. It is a wonderful color that adapts well with just about any other color. It is very neutral while added a touch of color. And it is not a cool gray at all-very cozy. I know that gray is a popular color choice, and I rather like it. But for you, Kristi, I think that you should not think about which gray you like because you have said you don’t like gray– instead you should think about which gray serves as a neutral backdrop to emphasize the very colorful items in your house that you do love. Like the coral buffet or the yellow piano. Choosing a color should be done with those items in mind (and in the photo) to make a good choice. Good luck! When picking out your grey though don’t forget to look at all the undertones and how they go with the rest of your color scheme. Blogger Maria Kiliam has great articles about gray and the different undertones in it. You made me come out of hiding with this post. 🙂 I read daily, but never comment. Regardless of what colour you choose, I’d highly recommend getting sample cans and doing a poster board sample of each colour. Moving them around to various places during different times and lighting conditions. 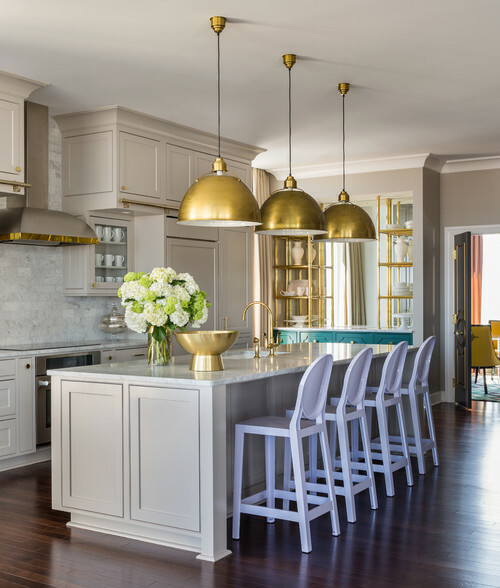 It helped my husband decide on our living room colour – Swimming by Sherwin-Williams (we wanted a turquoise that was warm as the room is north facing & we paired it with bege/brown/dhiny gold accents to give it the feel of a sun light beach (winters are long here) . Using the sample boards allowed us to pick a colour that made us happy. We used Woodrow Wilson Putty by Valspar in our house and I loved it. It is a beige/gray and I painted all my trim a white called Du Jour. Loved it. Whatever you do will be amazing though 🙂 Love your blog ! First of all, I’m a huge fan of grey and warm greys in particular. I have seen both SW colors you are considering and they both are very nice warm greys. However, I do agree with those who’ve said they feel like you wouldn’t ultimately be happy with grey on your walls. I agree with you that you need a nice neutral for a backdrop for all of your beautiful accessories. And, I love your plan to go with the lightest tone for the background for your custom “wallpaper”. I’m shocked. I actually defended the use of gray here once and got bashed. Now you want to use it?! I feel vindicated!! We just changed our formal living room/dining room with dark walnut chair rail and base boards to the white crown molding, chair rail, base boards, and picture frame molding on the lower part of the walls.I used a large piece of crown, and then painted about two inches down, and added the base cape molding, so it looks like I have a very large crown molding up! I used the color, coconut oil, from Lowe’s, on the top of the walls, and it is just enough color to make the room bright. It is a soft taupe/beige color. I used the same colorful curtains in both rooms to bring in different colors, since all of my furniture is solid colors. We also changed our all brick fireplace to mdf with moldings on it with marble stone. We also put in dark walnut hardwood, so the walls just pop. I look forward to your posts everyday, and you guys are in our prayers too. If you aren’t sure you need to keep looking; looking is way cheaper in time and money than putting a sample up ‘that might work?? ?’ You are better than this Kristi! Keep looking. I love grey and blue and adore it in magazines and other peoples’ homes but when I put it in my personal I tend to hate it. Just me, but I can only embrace blue if there is a tiniest bit of periwinkle and then I am OK! Keep looking and thinking! You will get perfection eventually. Just sayin’. I painted most of my rooms agreeable gray after a kitchen and family room remodel and I also worried about going gray. I’m absolutely in love with the color it looks fresh and works with every color. When I first purchased our home, I had similar thoughts to you… warm gray! it would be perfect! I found sooo many examples of paint colors I LOVED online and in rooms… from Revere Pewter, to a long list of beautiful warm grays. Then I put them on my walls.. and lived with it for a year. Revere Pewter… it looked AWFUL! All I can say it… it read BROWN. TAN. MUDDY. It was dark and dirty and all sorts or wrong… I hated it! It looked nothing like my inspiration pictures. I ended up repainting a COOL grey that ends up reading slightly too blue for my taste (and not my total favorite, I’m still on the hunt for a perfect not cool not warm grey) but is so much more fresh, bright and clean looking than the “warm” grey or greige. I love all the trim though… Haven’t read your blog in a few months and I’m catching back up, your work is always so inspiring!! I think Agreeable Gray would be a great backdrop to all of your colors- in your case I think Anew gray would be to much gray for you. Agreeable gray is light, sophisticated, and not harsh or sterile. I’m a bit surprised by your choice but if you don’t want white I do think gray is a good choice. It is neutral and your buffet will really stand up and be noticed! It will also make a good background for whatever art piece you use in the entryway and the window treatments. Go for it and love it! This is going to sound crazy. For some reason, I keep waiting for you to repaint your kitchen a blue. Somewhere between royalish and navyish. A rich darkish blue. In my mind, it pulls all three other bright fabulous colors together. And works beautifully with warm grays. Green is my favorite color and I think your kitchen is stunning. Everything I look at it, I envision it in blue with all your other design elements. Crazy, I know. I can’t wait to see how all of the walls turn out!! Okay I don’t know how you could make a choice with all these opinions! 🙂 There are some great thoughts and tips on here. The original color I suggested doesn’t have near the gray undertones some of the other colors suggested do. I think many of them will work great. I have wanted to jump on the gray bandwagon many times in the last five years. My home I am in now originally had gray everywhere. We had so many compliments about it. However, I could never get over the fact that my dark wood floors seemed to compete with the gray. They both send out opposite vibes. As soon as I repainted to an “out of date” tan color, the walls and floors seemed to compliment each other and neither of them tried to make any kind of statement at all. Funny i stumbled across this. My parents are redoing their home and are getting ride of the white walls in their powder room. went very similar to the light grey you are using above. Great look! I was leaning towards agreeable grey in my own home, but it didn’t fall in love with my , but I actually just used 30 gallons of analytical beige, it is seriously th e neatest color, it is kind of a chamillion(sorry I don’t know if that’s correct spelling) it pulls greys mostly. But it can look blues ish green our a little more tan. But always a nice warm color. Good luck. I love Agreeable Grey, and use SW almost exclusively, but have done the majority of my home in Abalone by Benjamin Moore- I think you would love it. Not too dark, not too light- and compliments my Sea Salt by SW, as well as Oyster Bay (SW) perfectly!! Good luck, love your work!! I see you are still getting comments a day after your post and here’s another. While personally I prefer the white with your fabric choices, potential artwork etc. there’s another option you might want to explore other than a grey. How about a very light buttery cream? Not a tan or beige cream, but buttery….you could either leave the walls white and use this cream on your trim for some contrast, or perhaps paint the wall areas the buttery cream and leave your trims white. It would give you the warmth and contrast you are looking for and blend in very well with what you have chosen for the fabrics etc. It would even look nice with the coral of your buffett. Just another thought. I came across this pic and it totally reminded me of your entryway w/ the decorative molding and pops of coral. I’m excited to see how yours turns out! Usually, you post a picture of your paint board samples. Did I miss it? You know, I thought of you this weekend when I was touring an historic mansion (the oldest house in my city). Not for the obvious reasons, but for a subtle one: nearly all the rooms and halls had wallpaper in various shades of blue or green. Because the papers were old and I viewed them in natural light, the net effect was beautiful. I say this because you’ve mentioned before that you always were drawn to these colors and wanted to step outside your zone. Don’t be afraid to stay in your zone and own it. Thank you for sharing your honest thoughts! I have heard this many times- you decorate with the thinking you love shabby chic but come to find you are strictly modern and have to start the process all over again. That is all apart of the fun (although you may be frustrated) in learning your personal style. Great post, very encouraging!